STANDING in the shade along a busy intersection in Phnom Penh, a traffic police officer takes a moment to answer his mobile phone amid the sounds of horn blasts and chatter from his Motorola hand-held radio. On the other end of the line his children eagerly await his voice. “My family worries about my daily activities, especially because they know I stand in the middle of the street and can get hit,” the officer explains, adding that his kids typically phone twice a day. He cites three police officers from his department who have broken their legs or had their toes crushed after being struck by vehicles, highlighting the inherent danger of enforcing traffic laws in the city. He says the job is becoming more difficult because of the increasing volume of traffic on the streets which, according to The Ministry of Public Works and Transport, grows each year by upwards of 20 percent. The officer watches over the congested noon-hour traffic as it passes through the streets. The impeccable ironed creases through his uniform offer a stark contrast to the fraying collar around his neck, complemented by sun-bleached trousers and a rusting belt buckle. “My wife and children iron this uniform for me after every wash,” he says with a smile before walking back into traffic to halt a motorbike. According to senior officials at the General Commissariat of National Police, Ministry of Interior, 460 policemen are currently enforcing traffic laws in Phnom Penh. Officers at various levels of the National Police hierarchy have agreed to share their personal experiences on the basis of anonymity, particularly on sensitive topics such as police policy and corruption. “I’m new to the police and my base salary [paid once a month] is 200,000 riel [about $50],” explains one of the youngest members of the squad, who says he joined the police after reading a job announcement from the Ministry of Interior. The officers say it is common for police to also work as motodops or taxi drivers because their salaries are low and the second job helps to support their families. “It’s getting a bit better,” one policeman says, citing a policy that began in 2008 where the wage doubles after the first year of service. But a meagre monthly wage is far from the only dilemma facing these policemen and their line of work. “We get three uniforms a year but it’s not enough,” another member says. “Some trousers and shirts don’t fit properly [when issued to us] so we often exchange them with other police officers.” He points to his pants. Further up in the hierarchy of the National Police, officials say a plan is in the works to secure more uniforms for police. “It’s not a good image for tourists to see,” explains one senior administrator, who says that five or six uniforms a year would be ideal. In the meantime, traffic police say they are eager for the Bon Om Tuk water festival, scheduled for mid-November, because they are provided new uniforms each year in time for the annual event. 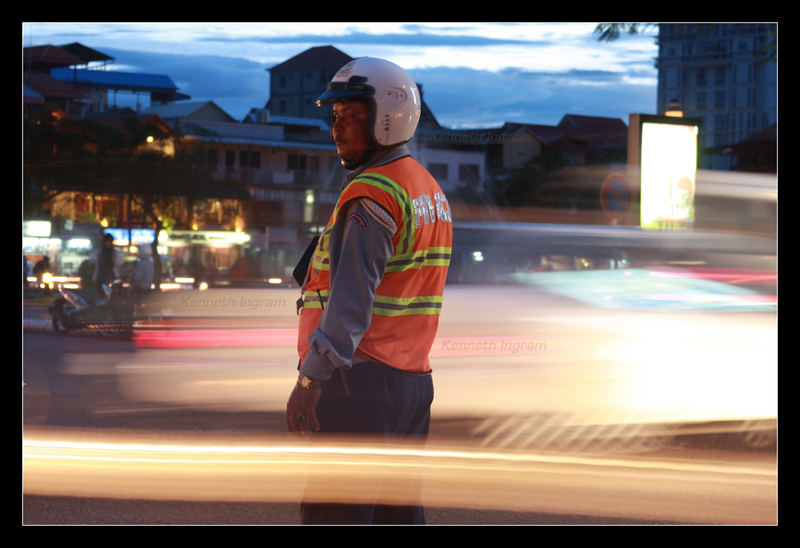 Traffic police in Cambodia have a dual function, according to officials of the National Police, who say their role is to educate the public and enforce the Law on Land Traffic, a 38-page official document that was adopted by the National Assembly near the end of 2006. Cambodia’s motor-vehicle traffic laws are available in both English and Khmer on the Ministry of Interior website, representing a milestone for Cambodia, according to officials within the Orders Department of the National Police, who say the laws are “eight to nine years” in the making. “Before 2007, traffic laws in the Kingdom were by decree only. It was just a piece of paper before,” explains one officer. “The decrees said ‘you should do this’ and ‘you should do that’, but they were not law.” Making a strong case for improvements in road safety and enforcement, Handicap International has compiled staggering statistics on the number of collisions and fatalities in Cambodia. The NGO found that road accidents disable more people under the age of 17 than any other cause in the country. Estimates show that four people die and nearly 80 are injured on roadways in the Kingdom every day, largely due to the higher number of road users, improved infrastructure that enables drivers to speed, and a lack of safety devices such as helmets and seat belts. Reports from Handicap International suggest that 90 percent of crashes involve motorbikes, bicyclists and pedestrians. Only eight percent of those involved were wearing helmets. “If you are riding a motorbike without a helmet you will be pulled over and fined by traffic police, 100 percent,” explains a senior officer at the Order Department, who adds that the new helmet law was not enforced in Cambodia until January 2009. 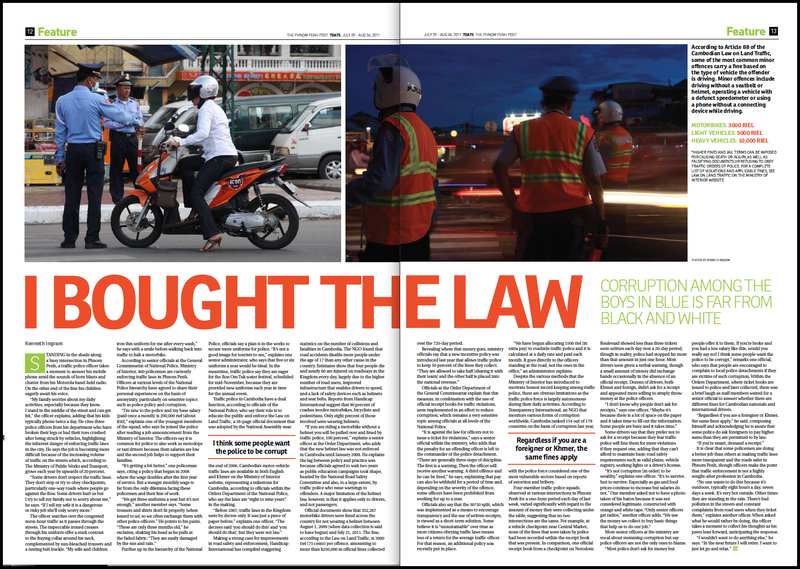 He explains the lag between policy and practice was because officials agreed to wait two years as public education campaigns took shape, headed by the National Road Safety Committee and also, to a large extent, by traffic police who issue warnings to offenders. A major limitation of the helmet law, however, is that it applies only to drivers, and not passengers. Official documents show that 352,287 motorbike drivers were fined across the country for not wearing a helmet between August 1, 2009 [when data collection is said to have begun] and July 21, 2011. 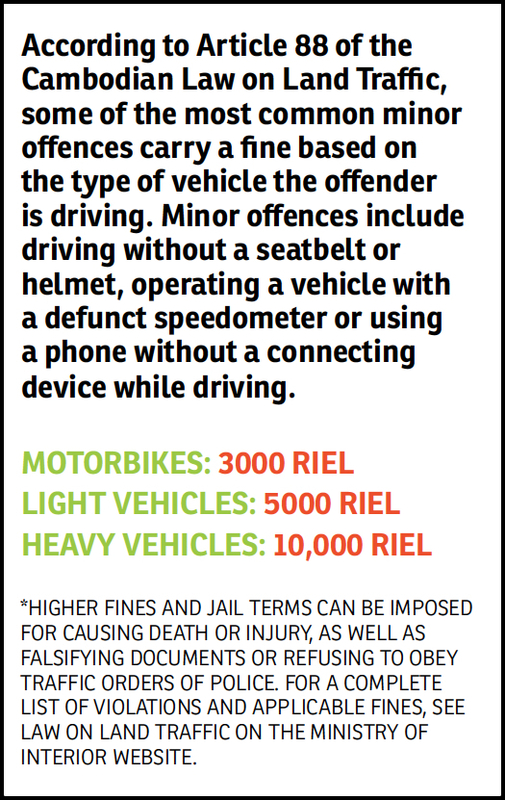 The fine, according to the Law on Land Traffic, is 3000 riel (75 cents) per offence, amounting to more than $250,000 in official fines collected over the 720-day period. Revealing where that money goes, ministry officials say that a new incentive policy was introduced last year that allows traffic police to keep 50 percent of the fines they collect. Officials at the Order Department of the General Commissariat explain that this measure, in combination with the use of official receipt books for traffic violations, were implemented in an effort to reduce corruption, which remains a very sensitive topic among officials at all levels of the National Police. “It is against the law for officers not to issue a ticket for violations,” says a senior official within the ministry, who adds that the penalty for an offending officer is left to the commander of the police detachment. “There are generally three steps of discipline. The first is a warning. Then the officer will receive another warning. A third offence and he can be fired,” he says, explaining that pay can also be withheld for a period of time and, depending on the severity of the offence, some officers have been prohibited from working for up to a year. Officials also say that the 50/50 split, which was implemented as a means to encourage transparency and the use of written receipts, is viewed as a short-term solution. Some believe it is “unsustainable” over time as more citizens obeying traffic laws means less of a return for the average traffic officer. For that reason, an additional policy was recently put in place. “We have begun allocating 1500 riel [in extra pay] to roadside traffic police and it is calculated at a daily rate and paid each month. It goes directly to the officers standing at the road, not the ones in the office,” an administrator explains. Despite the various methods that the Ministry of Interior has introduced to motivate honest record keeping among traffic police, there are obvious limitations as the traffic police force is largely autonomous during their daily activities. According to Transparency International, an NGO that monitors various forms of corruption worldwide, Cambodia ranked 154 out of 178 countries on the basis of corruption last year, with the police force considered one of the most vulnerable sectors based on reports of extortion and bribery. Four-member traffic police squads, observed at various intersections in Phnom Penh for a one-hour period each day of last week, varied significantly with regard to the amount of money they were collecting under the table, suggesting that no two intersections are the same. For example, at a vehicle checkpoint near Central Market, none of the fines that were taken by police had been recorded within the receipt book that was present. In comparison, one official receipt book from a checkpoint on Norodom Boulevard showed less than three tickets were written each day over a 20-day period, though in reality, police had stopped far more than that amount in just one hour. Most drivers were given a verbal warning, though a small amount of money did exchange hands occasionally in the absence of an official receipt. Dozens of drivers, both Khmer and foreign, didn’t ask for a receipt and appeared more willing to simply throw money at the police officers. “I don’t know why people don’t ask for receipts,” says one officer. “Maybe it’s because there is a lot of space on the paper and it takes time to fill out the information. Some people are busy and it takes time.” Some drivers say that they prefer not to ask for a receipt because they fear traffic police will fine them for more violations if they request one, adding that they can’t afford to maintain basic road safety requirements such as valid plates, vehicle registry, working lights or a driver’s license. “It’s not corruption [in order] to be wealthy,” explains one officer. “It’s to survive. Just to survive. Especially as gas and food prices continue to increase but salaries do not. One member asked not to have a photo taken of his baton because it was not considered legitimate, constructed with orange and white tape. “Only senior officers get radios,” another officer adds. “We use the money we collect to buy basic things that help us to do our job.” More senior officers at the ministry are vocal about stemming corruption but say police officers are not the only ones to blame. “Most police don’t ask for money but people offer it to them. If you’re broke and you had a low salary like this, would you really say no? I think some people want the police to be corrupt,” remarks one official, who says that people are encouraged to complain to local police detachments if they are victims of such corruption. Within the Orders Department, where ticket books are issued to police and later collected, there was a brief laugh as staff members waited for a senior official to answer whether there are different fines for Cambodian nationals and international drivers.